“After a dramatic transformation, the space formerly known as Cafe Dupont reopens as The Pembroke, beginning its inaugural dinner service tonight, February 8, with a complete makeover and all-new food & drink menus. 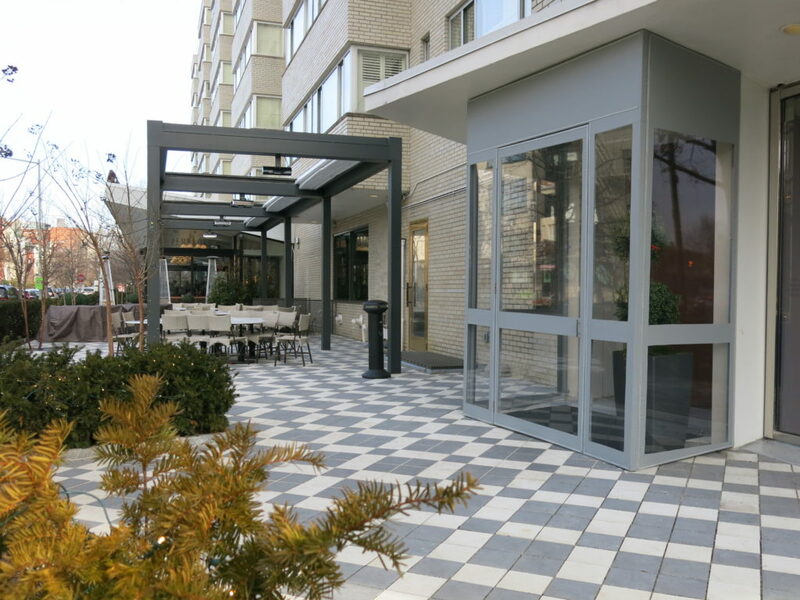 The farm-and-sea-to-table restaurant (1500 New Hampshire Avenue NW) seats 127 guests inside and boasts a 78-person seasonal terrace outdoors, adjacent to the venue’s stunning wall of floor-to-ceiling windows. 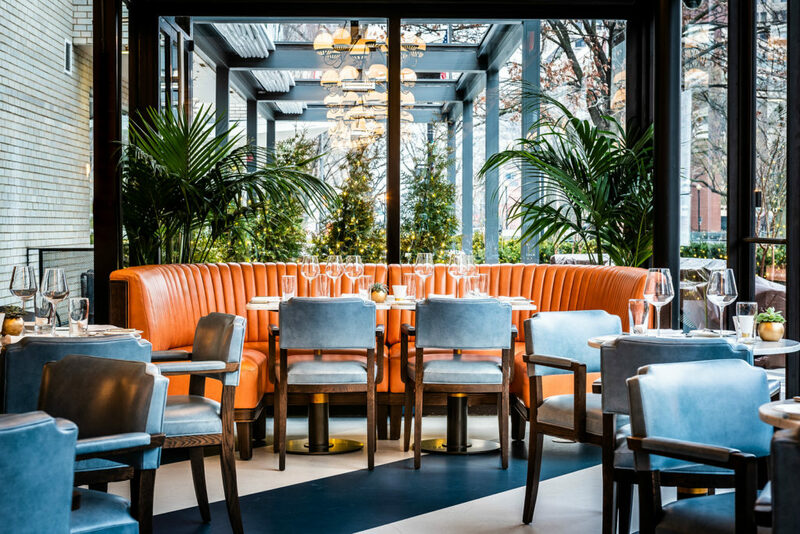 Interior designer Martin Brudnizki led the redesign, updating the restaurant with plush blue velvet semicircle banquettes, coral couches, brass light fixtures and hardware, marble tabletops and much more. 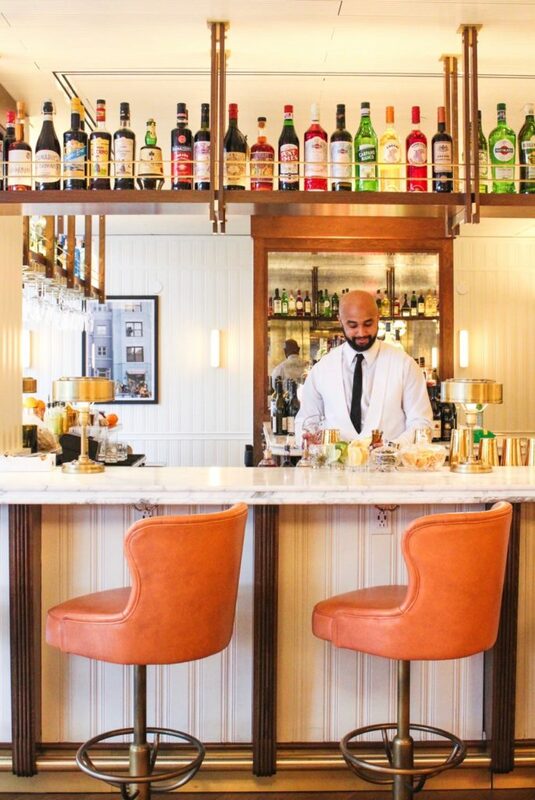 The 12-seat, 36-foot bar features spacious leather swiveling barstools situated at the beautifully appointed marble bar top, which is accented by beadboard paneling and gleaming gold barware. Acclaimed chef Marlon Rambaran helms The Pembroke’s kitchen, bringing his nearly 20 years of culinary experience from some of the top restaurants in New York, Miami, Philadelphia and more to the nation’s capital. Rambaran has worked closely with local farms and purveyors to source the best organic and sustainable products. The Pembroke’s new dinner menu embraces global accents from Morocco, France, Italy, Ireland, Spain and more featuring dishes like lamb shank tagine with couscous, almonds and dried fruit; decadent lobster bisque with lobster morsels finished with cognac; tender grilled octopus with chickpeas, potatoes and herb salad and dover sole offered grilled or meunière. One of the highlights of the all-new entree lineup is the succulent short ribs dinner, which gives a nod to the restaurant’s Emerald Isle roots, being served in an Irish whiskey glaze alongside pureed parsnips. Vegetarian, vegan and gluten free options are also available with items like toasted farro, quinoa, crispy brussel sprouts, squash, sweet potatoes, homemade gluten free pastas and salads. On the 10-cocktail drink menu, the fresh, floral-infused “Rose Petal Martini” stands out, as does the “Adonis,” a mix of coffee-infused Fino sherry, sweet vermouth and orange bitters. The wine list at The Pembroke is also impressively extensive, with nearly 70 bottles and almost 30 glasses of sparkling, white, red and rose from around the world. The Pembroke serves breakfast as well, offering a selection of egg dishes, pancakes, French toast, waffles, sweet and savory breakfast bowls and steel-cut Irish oatmeal, in addition to vegetable and protein sides and fresh-baked pastries.